Rubenerd: #Anime The cutest hotlink image? #Anime The cutest hotlink image? 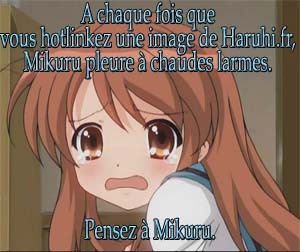 Allegedly hotlinking makes Mikuru so upset she starts blurting out Français! From http://mikuru.haruhi.fr/, surprising though it may seem. Imagine if I hotlinked this image. "Dawg, I heard you like hotlinking, so I hotlinked the hotlink image you can hotlink while you hotlink!" Add Xzibit to the list of celebrity based memes I fail at. Newer post ← Getting a tweet from Cory Doctorow!